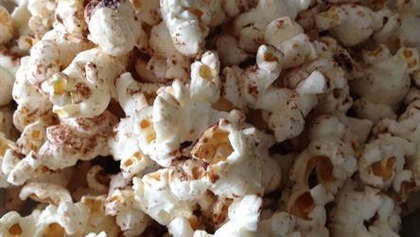 Pop the popcorn in your hot air popper. Mix the sugar, cocoa, cinnamon and salt in a small bowl. Pour half the popcorn into a large bowl and drizzle with half of the butter and half the seasoning. Toss to mix. Add the second half of popcorn to the bowl and repeat with butter and seasoning. Give the whole bowl a good shake to infuse the coating to the kernel.